Developer who sought to revitalize King Harbor has a proposal for Alamitos Bay Marina project. LONG BEACH — Plans to tear down a waterfront hotel and replace it with a visitor serving retail center earned the unanimous backing of Long Beach’s Planning Commission on Sept. 7, as the advisory committee backed CenterCal Properties’ proposal to revitalize a large commercial lot across the street from Alamitos Bay Marina. Nearly 245,000 square feet of visitor serving uses could be built at the Second Street and Pacific Coast Highway lot, which has been vacant since Seaport Marina Hotel shut down in February. A Whole Foods market would likely be the anchor tenant of the proposed commercial center. The plan in front of planning commissioners called for the new “2nd & PCH” project to feature a series of one- and two-story buildings with transparent architecture. Each building would, according to a Planning Commission staff report, include a combination of operable glass walls, porches, patios and verandas. Adding the CenterCal project at the northeast corner of Alamitos Bay Marina would certainly make a busy area even busier. At least three shopping centers already exist in the area, in addition to a dense commercial destination blocks away at Belmont Shore. An official website for the project stated the commercial center’s design is inspired by Alamitos Bay Marina. “2nd & PCH will be a coastal contemporary retail and restaurant destination inspired by the neighboring marina,” the opening salvo of the redevelopment project’s website stated. Other planned uses of the 2nd & PCH project include a health and fitness club and dining options. 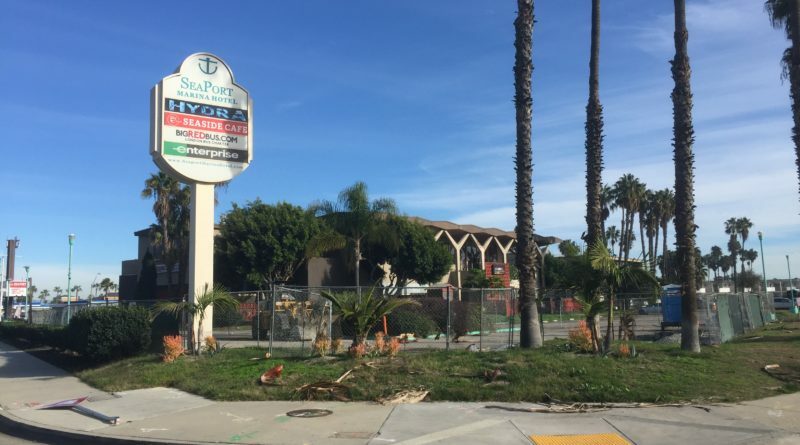 Long Beach city staff added the 2nd & PCH project is part of a larger improvement plan for Marina Drive, which separates the former Seaport Marina Hotel property from Alamitos Bay Marina. The city’s Marina Drive Complete Street Improvement project would ultimately allow for expanded development adjacent to a stretch of Alamitos Bay Marina. Changes could include reducing road size for vehicular traffic, allowing for increased bicycle uses and introducing other streetscape enhancements. Construction of the retail and visitor serving project would take about 16 months to complete, according to Long Beach city staff; 2nd & PCH is expected to be operational in 2019. The Second Street/Pacific Coast Highway intersection is home to one of Los Angeles County’s largest marinas and also serves as a gateway into Orange County. Also in the area are residences, restaurants, the Marina Pacifica Mall, Los Cerritos Wetlands, Davies Boat Launch Ramp and a variety of retail or grocery stores. CenterCal – an El Segundo-based developer – recently proposed to revitalize Redondo Beach’s King Harbor, but whether such plans would move forward became uncertain after local residents approved a ballot initiative to restrict commercial growth on the city’s waterfront. The CenterCal proposal called for a new waterfront mall to be built adjacent to the recreational boating venue, similar to the company’s redevelopment plans for the old Seaport Marina Hotel property.